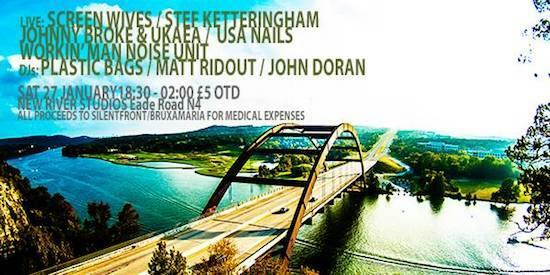 New River Studios are holding a fundraising event on Saturday night for all the members of Bruxa Maria and Silent Front who were injured in a serious road accident in France last weekend. The absolutely blazing night, which only costs a god damned fiver to get into features sonic titans USA Nails - we're hoping for some much needed catharsis when they play their atom smashing cover of The Fall's 'L.A.'. The line up also features DIY/ New Weird Britain favourites UKAEA doing a set with Johnny Broke; Screen Wives; Steff Ketteringham and Workin' Man Noise Unit. DJs for the night are Plastic Bags, Matt Ridout of Casual Nun and Hominid Records and tQ's John Doran who will be playing a straight mix of The Fall, records that feature vocoders and heavy African funk. If you can't make it over to New River Studios but you're a fan of 'This Kind Of Thing' then please visit the Just Giving page. The most seriously injured, Matt Cargill of Sly And The Family Drone, was thrown from the vehicle and due to his injuries he remains in CHU Amien-Picardie, although he is out of surgery, in good spirits and on the mend. New River Studio is on Eede Road, walking distance from Manor House tube and Stamford Hill overground. Doors at 6.30pm, open til late. Everyone at the Quietus HQ wishes a speedy recovery - both mentally and physically - to everyone involved in the accident. We would also like to thank our several French readers who offered their services as translator. Merci.